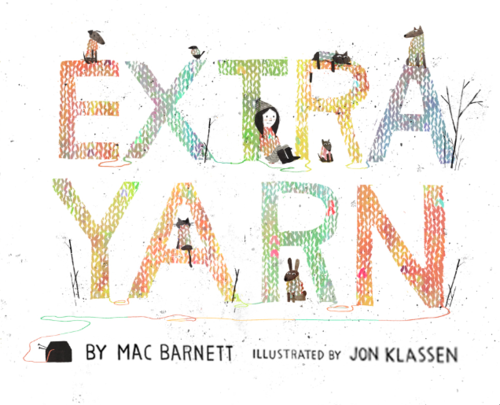 Our BLG reader Bill walked in with two books today and gave me a look that asked, “Which one?” I had already spotted Extra Yarn written by Mac Barnett and illustrated by Jon Klassen in his hand. That other book, whatever it was (and it might have been wonderful) didn’t stand a chance. Extra Yarn delighted us! This story is set in a dreary little town. Cold invades and everything is black with soot or white with snow. When Annabelle finds a box filled with multi-coloured yarn, she is quite inspired. 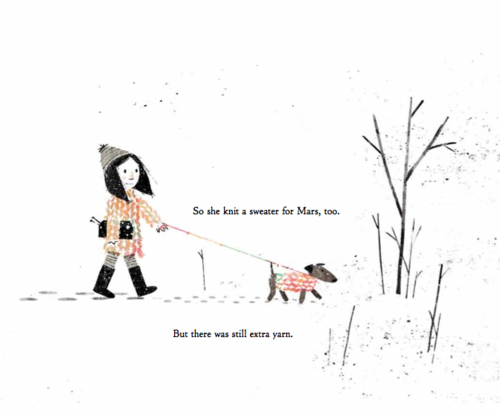 Soon she has knit herself and her dog Mars cozy sweaters perfect for brisk walks outside. Strangely, there is still extra yarn. so Annabelle begins to outfit her whole town, even the naysayers (like Nate who turned out to be jealous until he possessed a knitted sweater of his own). “Wow,” someone commented. “They sure look warm to me!” Somebody else sugested Nate would look good if Annabelle knit him skinny pants. Maybe . . . ? But Annabelle had turned her attention to her classmates and teacher. When she had knit a sweater for everyone, there was still extra yarn. The pictures began to illicit many comments. The yarn supply did not diminish and neither did Annabelle’s creativity. She knit sweaters for the animals. And sweaters for things that might seem to not need sweters. Birdhouses. Trees. Mailboxes. This was incredible! When an archduke from far across the sea sailed to Annabelle’s shore and offered Annabelle millions for her box of yarn, she politely but assertively refused. But the archduke had his ways. He sent in three robbers to steal the box of yarn and bring it to him. When he opened the box on the other side of the ocean, it was empty. He was furious! He cursed Annabelle! “Little girl, I curse you with my family’s curse! You will never be happy again!” Students leaped up, caught in the excitement and quoted him! But we weren’t worried. In the end, the box of yarn ends up where it is supposed to be and . . . not empty at all. Truman:I like the part when the Archduke didn’t get any yarn. But when it got back to Annabelle, it still had more. Isa: This book was so good I have to write about it. That pirate guy (the Archduke) said, “You’re never going to be happy again.” But that actually didn’t happen. The curse didn’t work. She was sewing sweaters for everything in the town. That was so funny! She couldn’t make it for ice cream though. It would melt! Carmen: I can’t believe that this little girl Annabelle knitted a sweater and house, tree, sweaters for everyone except Mr. Crabtree. He wears shorts with snow up to his knees and never wears sweaters. So Annabelle knitted him a hat. Khai: I like how she filled the whole city with yarn. It was cool. This entry was posted in BLG Reads this week and tagged BLG Reads, favourite illustrators, fiction, great read alouds, Jon Klassen, Mac Barnett, picture books by carriegelson. Bookmark the permalink.